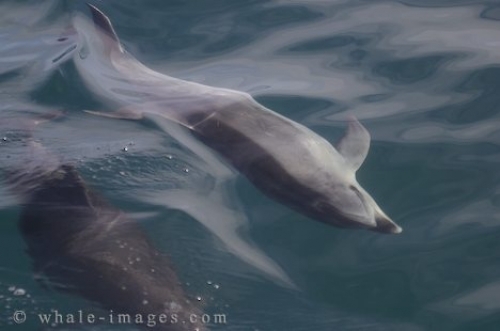 This Picture shows two bottlenose dolphins swimming beside a small dolphin watching vessel in the Bay of Island in New Zealand. The Bay of Islands are a great spot to take pictures of bottlenose dolphins (Tursiops truncatus). There are several dolphin watching operators, some even offer a swim with the bottlenose dolphins, in the Bay of Islands on the North Island of New Zealand. Bottlenose Dolphins are found in warmer and tropical oceans around the globe. Theses very playfull dolphins can reach a length of up to 4 Meters (about 12 feet) and can swim up to 20 KM per hour (12 Miles). Picture of two bottlenose Dolphins beside a dolphin tour in the Bay of Islands off the North Island in New Zealand.